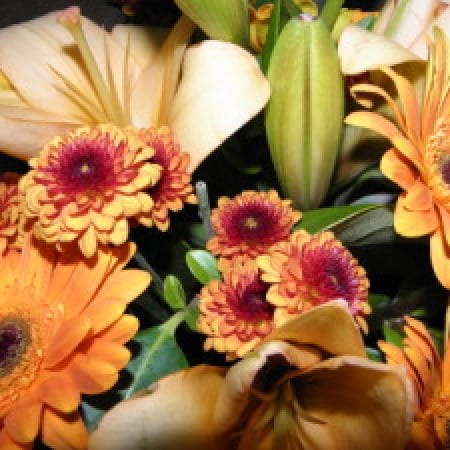 Seasonal bouquet of mixed blooms in golden and orange tones. Features asiatic lillies, gerberas and a selection of foliages presented in gift wrap and delivered in a convenient temporary vase. A wonderful way to send thoughts a friends way, a unique bouquet from Amaranthine Flowers By Design, Charlestown Square, Newcastle. Same day delivery available, seven days a week, to all areas of Newcastle and Lake Macquarie, including John Hunter Hospital, Newcastle Private Hospital, Lake Macquarie Private Hospital, and Mater Hospital.